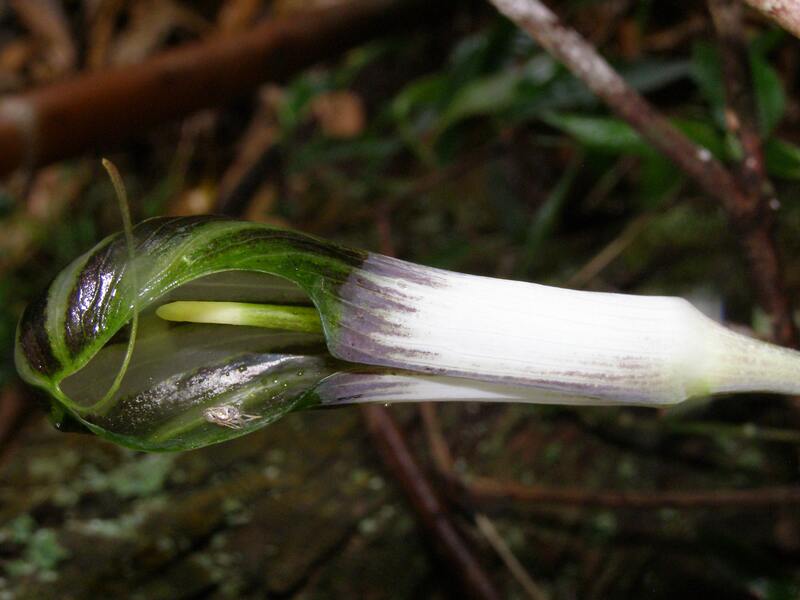 After years of looking for the plant, naturalist Tarun Chhabra chanced upon several flowering Arisaema translucens in 2009 in a patch of shola forest in the Nilgiri mountains. Specimens of the species were collected in 2016. Researchers say that A. translucens could be threatened by illegal collection and expansion of tea estates into the shola habitat of the plant. While the team has not yet assessed the species’ conservation status, the plant is most likely to be at risk of extinction. 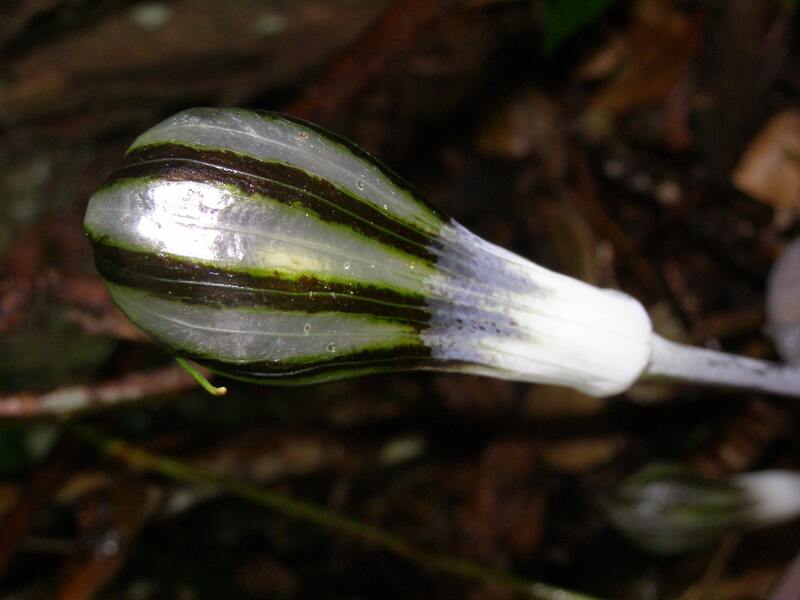 Naturalists in India have rediscovered a rare flowering plant — Arisaema translucens — after nearly 80 years. Botanist Edward Barnes first collected this plant in 1932 from the Nilgiri mountains in southern India. The plant, commonly called a cobra lily and noted for its translucent spathe (a large leaf like plant part that encloses a cluster of flowers), was then scientifically described in 1933. Since then, there have been no confirmed records of this species. Intrigued by the plant’s record, dentist and naturalist Tarun Chhabra began combing the Nilgiris for Arisaema translucens. He searched for the plant year after year, and finally in 2009, chanced upon several flowering Arisaema translucens within a small patch of shola forest — a mosaic of grassland and stunted evergreen tree species — within the Nilgiris. 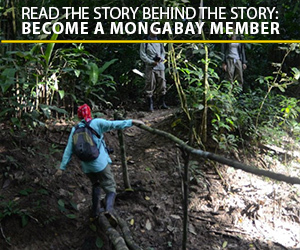 “It felt unbelievable to finally see this plant. It looks beautiful,” Chhabra said. Botanist and co-author K.M. Prabhukumar of the Centre for Medicinal Plants Research in Kerala, who collected specimens of these plants in 2016, added that no other Arisaema species has such translucent spathe, making this species unique. The team also collected specimens of another rare cobra lily species, Arisaema tuberculatum from the Nilgiris. Together with scientists K.M. Prabhukumar, Indira Balachandran and others, Chhabra then described the two species in a new study published in Phytotaxa. Both species are believed to be found only in southern India. Arisaema translucens has a unique translucent spathe not recorded in other Arisaema species. Photo by Tarun Chhabra. Many species of Arisaema, such as the Japanese A. heterocephalum, are prized for their beauty and threatened by illegal collection. The researchers say that A. translucens could also face a similar threat and needs immediate protection. Moreover, the small patch of shola where the species was found is surrounded by expanding tea estates that threaten to wipe out the plant’s habitat. Chhabra hopes to work with the tea estates to help protect forest areas that harbor these rare species. While the researchers have not yet assessed the conservation status of A. translucens, the species is most likely to be at risk of extinction, the team says. Arisaema translucens was rediscovered after more than 80 years. Photo by Tarun Chhabra.